Up until last year I only knew how to write using one type of letters–Roman aka Latin and all of the languages I studied used it. Now I’m excited I learned Hangul or Hangeul, the Korean alphabet. 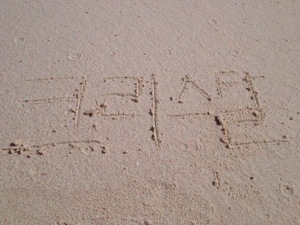 I guess I’m the equivalent of a 3 or 4 year old–I know the letters but few Korean words can I recognize. People often ask why I’m trying to learn Korean. It started with watching dramas and listening to K-pop, but gradually I realized I just wanted something challenging for my brain, which is fun for me. It’s as fun as learning French was only more challenging because I have to learn new letters along with a new language. 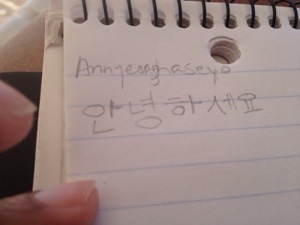 Here’s my name (spelled phonetically) written in Hangeul. 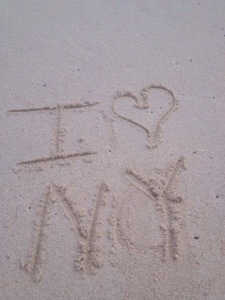 Apparently, I do a lot of writing letters in the sand. This slogan has been used since I was a kid, if not longer. 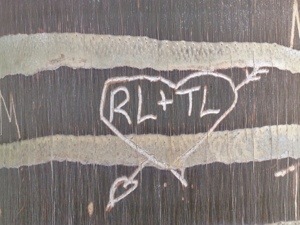 Lovers are fond of carving their initials or names linked together for everyone to see. Like on this tree and this aloe plant. As if doing this makes the relationship official. 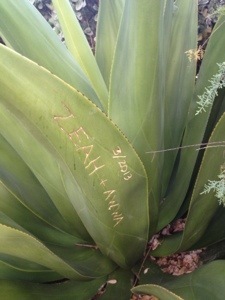 It’s universal I think, humans defacing property to declare their love. Thanks weekend was great! I remember saying at one point learning Korean would be easier than Mandarin Chinese or Japanese because it would take too long to learn all of those characters. Figured an alphabet would be easier. Haha. Didn’t think about how word order is different–SVO vs SOV. Nor did I realize I’d have to learn the levels of speech. I’m probably at the point where I need a more organized, consistent way to learn.